DIY fails happen to the best of us. Especially when it comes to lawn care. If you’re planning on taking care of your own yard in the Cedar Rapids, Iowa area, be careful to avoid a few common mistakes that could jeopardize the look and health of your landscape. And always remember, if you get in a jam, your friends at Lawn-Tek are ready to lend a helping hand! It’s so nice to see your lawn again, you want to shower it with love (and water). But resist the urge! In addition to being wasteful and running up your water bill, soil that is constantly wet creates many problems for plants and the soil. Since they are essentially being drowned in water, the grass roots are deprived of oxygen and may become more susceptible to disease since diseases thrive in wet conditions. DIY Best Practice: The best way to water your lawn is twice per week with approximately 1/2″ of water each time. This should take around 15-20 minutes, depending on your sprinkler or irrigation system. Watering infrequently but in heavier amounts gives the grass the correct water intake without the risk of over-watering and causing the roots to weaken. Not only will this help your grass remain strong and resilient, you will also save money by limiting the number of days and amount of time you water the lawn. DIY Best Practice: Always read fertilizer labels and apply exactly according to the instructions. 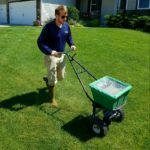 Different fertilizers come in different strengths, and it’s important not to over apply them to your lawn. If the grass in your lawn is in poor condition, fertilize it very lightly to ease it back to health. Resist the urge to feed heavily, since weak grass is easily burned. 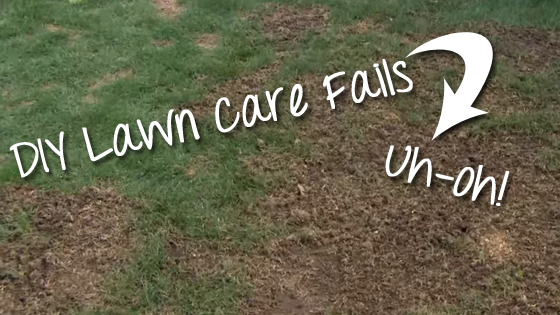 Don’t fertilize lawns that are severely stressed by drought, heat, or disease – it can cause further damage. If all else fails, contact Lawn-Tek to set up a strategic Cedar Rapids lawn fertilization & weed control treatment program. Leave the clippings on the lawn! Leaving the clippings will save you time and energy, and it will return valuable nutrients to the lawn. The most important thing you can do for your lawn is to feed it regularly. Grass clippings contain the same beneficial nitrogen, phosphorus, and potassium nutrients as fertilizer. In fact, clippings can provide as much as one-third of the annual feeding requirement for your lawn. DIY Best Practice: Keep your mower blade sharp and mow regularly, only cutting one-third off the height. Avoid mowing when the grass is wet. If the grass gets so long that mowing at your normal cutting height will remove more than one-third the length of the grass blades, raise the height on your mower. Mow once at the raised cutting height, then again in a different direction at the normal height. 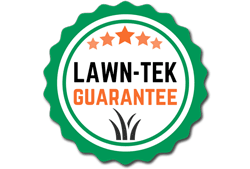 I’ve been using Lawn-Tek for the past few years and they have totally transformed my lawn. Where I used to have random crab grass and creeping charlie there’s now just beatuful grass. Everyone I’ve dealt with has always been friendly, and kind and the staff have always gone the extra mile to make sure I understand their process! – Brian H.
Click Here to read more reviews from our happy customers! Contact us today or fill out or free online estimate request form! Talk to you soon!